For the first twelve years of our marriage, we lived in a 40’ x 9’ trailer. We had renovated the inside, built a roof and an extra room. Most people didn’t realize it was a trailer. Just a really well planned little cottage. Its lights ran off a 12-volt car battery, while the stove, fridge, hot water and furnace all ran off propane. It was set up like a boat, a cupboard or a drawer for everything. Anything that didn’t fit, wasn’t kept, or was relegated to a storage room in our barn. The kitchen, although tiny, was really efficient. Something I carried forward to our home when we built it. I’m proud of the meals our kitchen has provided. From the everyday ones to the meals that just keep on going. One of its first epic meals was dinner the day the trailer was being moved from our place to friends that were about to embark on building their home, and needed a small home to shelter their family of 5. The moving of the trailer was an all day event. It had been sitting in the same place for years, and needed to have any additions removed before it could start its long trek out of our place. With lots of eager people dropping by to help out, we ended up with over 20 people at our place. When the trailer was towed past the house, and out onto the driveway, we all cheered as it trundled past. Our cheers were a bit shortsighted. It only made it about halfway up the driveway before it was stuck. It would be hours before the guys figured out how to get it out. We have a very steep and windy driveway, about .3 km long. As everyone was standing around scratching heads, I realized that their vehicles were all going to be staying put for a long time. Somehow I was going to have to pull dinner out of a hat. Scouring the freezers and the fridge, we came up with a wonderful meal of this and that, fed everyone within 2 hours, even making a dessert. The house was full of people laughing, talking and eating. No one seemed very concerned about things; some of the youngest children were asleep waiting until the drive was cleared. Sometimes a meal is just about being together. It doesn’t need fancy ingredients, it just needs to be simple and taste good. Here’s a simple (really simple) recipe that can be the center of an easy meal with good friends, or the centerpiece of a dinner party. It can be doubled and tripled easily. 2 whole lemons – cut into eighths – cut in half, cut each half into 4 pieces. 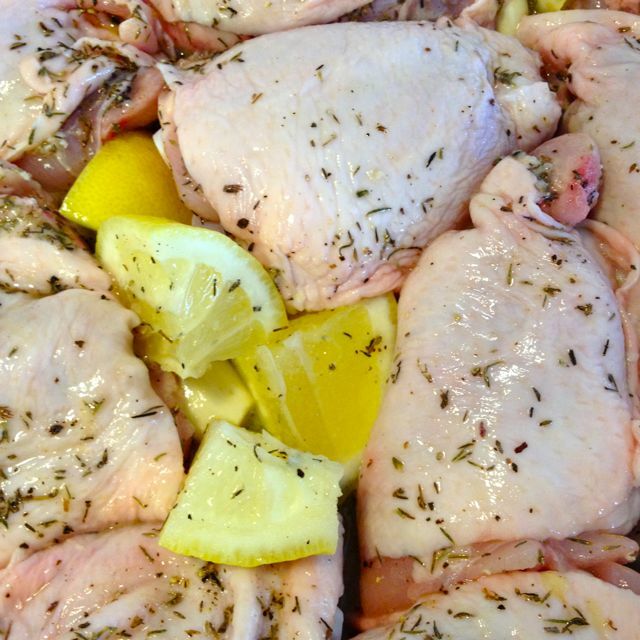 Lay the chicken pieces in a roasting pan large enough to hold all the pieces in one layer. Toss in the lemon pieces, the un-peeled garlic and the thyme. Just pull the thyme stalks through your fingers as you pull off most of the leaves. The twigs can be left in for extra flavour. Drizzle with the oil, and thoroughly combine everything with your hands. 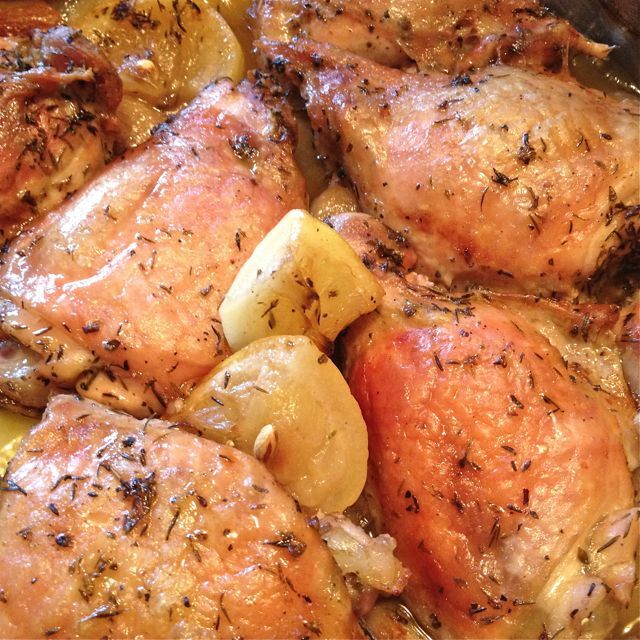 Finish by spreading the chicken evenly throughout the pan, skin side up. Distribute the lemon and garlic pieces evenly. Pour in the wine and season with some black pepper. Remove the foil and increase the temperature to 400° and continue cooking for another 35 minutes. The meat will start to brown, and the lemons may begin to scorch a bit. Sprinkle with a bit more fresh thyme and serve straight from the pan, with all the goodness surrounding the chicken.